James Stuart became king of England in March 1503, following the death of the last monarch of the House of Tudor, Elizabeth I, the daughter of Henry VIII, king of England. Robert Carey brought the word of Elizabeth’s death to James, already king of Scotland as James VI, at Holyrood House in Edinburgh on March 26. There was more at stake than the throne of Scotland, because Mary also had a claim on the throne of England through Margaret Tudor, the daughter of Henry VII, king of England. Margaret had married James IV of Scotland. By the beginning of February 1567, Elizabeth recognized Mary, Queen of Scots, as heiress to the throne of England (since Elizabeth was childless). Thus, through his mother, one day the infant James would reign in England. Elizabeth had already undertaken to be the baby boy’s protector. With such high dynastic stakes, the fate of the conspiratorial Darnley was sealed. On February 10, 1567, he was killed when his house was blown up with the knowledge of, if not on the orders of, Mary. However, the death of Darnley brought neither peace to Scotland nor security to Mary. Defeated in battle by James Stewart, earl of Moray, Mary in May 1568 made a surprising decision—she would seek refuge with Elizabeth in England. Her closest supporters urged her to go to France, where she had been queen to King Francis II, who had died in 1560. Nevertheless, she entered England. Once in England, she remained in varying stages of confinement until Elizabeth had her executed for plotting against her in February 1587. During the intervening years, James was brought up in the Protestant faith, his guardians preventing any exposure to the Roman Catholic religion of his mother. At 19 years of age, he became monarch of Scotland as James VI. It appears that the goal of succeeding to the English throne became the abiding ambition of James VI. Indeed, he was so fixated on this goal that his reaction to the trial and execution of his mother was quite mild. Then in March 1603, upon the death of Elizabeth, James VI of Scotland also became James I of England. In becoming king of England James had not reckoned on the growing assertiveness of the English parliament that Elizabeth had managed throughout her long reign (1558–1603) with an effective mix of feminine guile and political art. 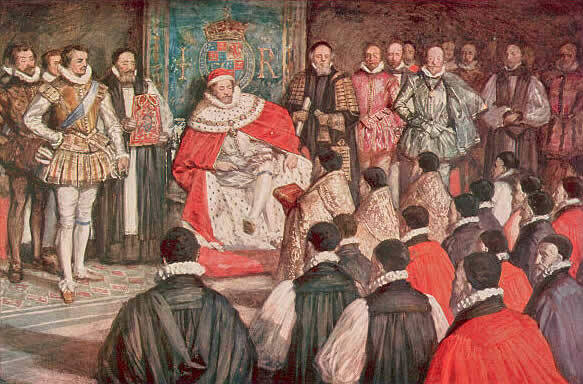 James’s deep-set belief in the divine right of kings brought him into collision almost immediately with his English parliament. He attempted to stay on good terms with Parliament, especially when the Catholic-inspired Gunpowder Plot of 1605 was seen as an attack on the entire Protestant settlement of England. For a time, Parliament and king could combine against the common foe of a Catholic conspiracy. When Parliament refused to accept James’s Great Contract, James took the dramatic step of dissolving Parliament in 1611. Parliament met twice more during James’s reign, and both times he dissolved it again. His overall adroit handling of the situation can be attributed to the wise guidance given James by Robert Cecil, first baron Cecil of Essenden, and the son of Elizabeth’s wise councilor, Lord Burghley. When Cecil died in 1612, the king lost his most astute adviser. As evidenced in his strong belief in the divine right of kings, James had a special interest in religious matters. In 1604, he presided over the Hampton Court Conference, which produced a new and definitive Protestant version of sacred Scripture known as the King James Bible. For a man skilled in the modern arts of political intrigue, he was a firm believer in witches and in 1604 made witchcraft a capital offense, without benefit of clergy. In foreign affairs James’s later years were overshadowed by the eruption of the Thirty Years’ War in Europe, a struggle between Catholic and Protestant nations that ravaged central Europe, where many of the battles were fought. Although James’s daughter Elizabeth was wed to Frederick V, the elector Palatine, one of the Protestant champions, James’s son Charles was engaged to marry the daughter of the Catholic king Philip III of Spain in 1623. Ultimately domestic opposition in England ended the arrangements for a Spanish marriage. Charles instead would become engaged to wed Henrietta Maria of France, the daughter of Henry IV, king of France and Navarre, who had brought an end to the Wars of Religion in France, and the sister of King Louis XIII. Although often derided as a witless king, James I proved himself to be a wise ruler. He managed to keep Scotland and England united, though bitter enemies for centuries. On the world stage in 1607, English voyagers to the New World arrived in what is now the United States and established the first permanent English settlement at Jamestown. 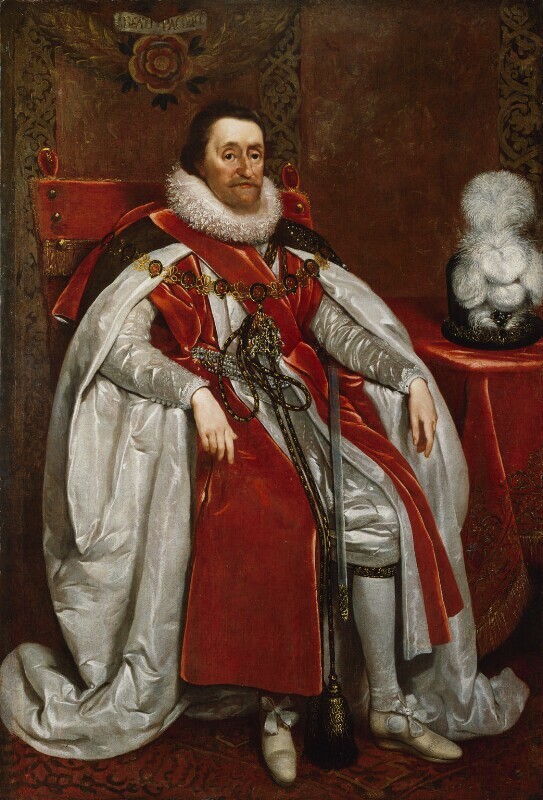 Thus, when James I died in March 1625, he not only could lay claim to the union of England and Scotland, but to the foundation of what would become the British Empire.